Greenpeace Brazil have launched a new initiative called the 'Black Pixel Project.' 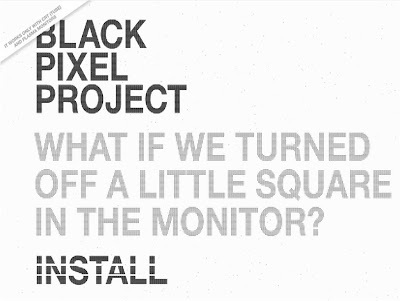 Greenpeace are encouraging people to install a single black pixel to their monitor to save energy - claiming that 1 million black pixels will save 57 watts of energy per hour. The Blackle idea is claimed to originate from a post on the Ecorion blog that claimed a Black Google would save 750 Megawatt-hours each year and this post was inspired by an article from Rising Phoenix design that claimed that showing a black screen takes 59 watts vs a white screen that takes 74 watts (based on a CRT monitor.) The Greenpeace Black Pixel project is quoting 57 watts for a full black screen. - Blackle does reduce power usage on CRT monitors, but only one of the CRT monitors showed a decrease of 15-watts or more. - with the 23 LCD monitors tested "the power consumption difference between Google and Blackle on all 23 LCD monitors was as small as you could get – an increase of 100mW (0.1Watts). So after all that testing, we’re in a better position to say that anyone else that Blackle makes next to no difference, on average, with LCD monitors." The Wall Street Journal asked Steve Ryan from Energy Star to test the theory on Blackle saving power and he found savings of between 5-20% on a CRT monitor and that LCD screens may offer no benefit. These tests are on Google vs Blackle though, rather than on a single pixel - and an average screen displays up to one million pixels at any one time. Installing a single black pixel may therefore not actually offer any benefit to the environment (other than for the few remaining CRT monitors) and the energy used to host and serve the promotional video on YouTube may actually outweigh any savings gained from the Black Pixel Project! However, climate change and environmental concerns are important issues for our future. It may be that the Black Pixel Project does not deliver actual environmental benefits in itself, but in highlighting our need to reduce personal energy consumption it could prompt more people to think about the energy their computers use - which in itself is probably time well spent. I did some back of the envelope calculations on the black pixel thing, based on a 50x50 square of black pixels, a pretty bad CRT (ie best case for this back pixel thing) and 5 hours of use per day and a 150W computer. I reckon even with a bad CRT you're saving around 10mW (ie one hundredth of a Watt) at best. * Installation: Let's say it takes you 5 minutes to install the black pixel software. It will take over 50 days of use before the black pixel thing pays back those 5 minutes used to install it. * Cup of coffee: It will take about 500 days of using this to save the electricity needed to heat a cup of water. You'd do far more for the environment by drinking one less cup of coffee per year. * Heating: If you're using electricity for heating, then you would save more electricity by standing up and sitting down once every 8 hours. Your body burns energy when you stand up and sit down, that makes heat. You're making more heat by doing this activity once every 8 hours than the black pixels are saving in the same amount of time. Now I'm all for simple things that people can do to make a difference, but this black pixel thing really does nothing useful. Some might argue that it raises awareness, but I say nonsense; it actually creates confusion. All the while people are thinking about a few black pixels they are not thinking about the big ticket items that really make a difference. It also alleviates guilt. Instead of feeling guilty and switching to an LCD monitor or using their computer less (which would make a real difference), they feel it is OK to use their computer longer because it now has the black pixel thing and end up burning more energy. It is far more important to give people clear messages about important things than it is to give confusing messages about nonsense. If Greenpeace really care about the environment they'd discontinue this black pixel thing immediately.